This is one of two LPs marking the return of Beak Doctor, the San Francisco-based label that was in the vanguard of recording free improvisation in America from 1978 on. Founded by pianist Greg Goodman, the label initially released his duets with Evan Parker, as well as a Parker solo recording and 1980 studio and concert performances that included Goodman, Derek Bailey, Parker, Henry Kaiser, Toshinori Kondo and ROVA. This duet with Bailey on electric guitar and Goodman on “objets d’interieur” (piano interior with lots of plucking and sweeping that suggest a giant zither and finger picks, among other things) was recorded in Eugene, Oregon during a 1992 tour. Goodman is a latter-day surrealist. The name and image of the label refer to a medieval plague doctor whose bird-like mask contained medicinal herbs (to benefit the doctor). 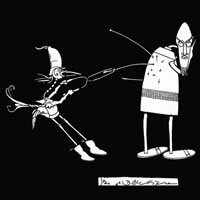 The artwork and titles (a consistent feature of Beak Doctor releases) come from a single book from 1920, The City Curious by writer and illustrator Jean de Bosschère, a proto-surrealist whose work somehow bridges Hieronymus Bosch, Comte de Lautréamont, art nouveau and the best pages of early Mad magazine. The spirit also informs the music here. Each side of the LP is devoted to a 20-minute improvisation which has a certain canny self-awareness combined with genuinely dream-like qualities. The first side, “The Mother of the Crow,” begins in spiky dissonant guitar clusters with what sounds like brushes on the piano. Before long the plucked piano strings are engaged in a rhythmic dance with the guitar, with a remarkable similarity in quality of musical thought, Goodman’s plucking and strumming in ideal synch with Bailey’s vestigial rhythm guitar, the two musicians’ lines combining, their instrumental approaches conceptually indistinguishable, notions of strings, percussion and resonance merged. The second side, briskly entitled “A Band of our Rats Will Each Morning Copiously Water our Fleet (Take this Umbrella)” is more of the same, but with certain suggestions and the mysterious synchrony carried further. It opens with a kind of thematic statement by Bailey, his clusters simultaneously mining the edges of his timbral resources from harmonics that sing out to muffled undertones. Goodman’s entry with high-speed, high-pitched strings combines with Bailey’s figures to suggest, somehow, a kind of maddened baroque, a strange recollection of a harpsichord (or maybe HPSCHD). At times this work is as stately as church music and as pretty as a music box, though radically refigured by sonic imaginations as unlikely as de Bosschère’s. This is among the most revelatory archival issues of recent years, a brief partnership in which two musical minds are so closely synched they hardly seem to be improvising at all, simply performing pieces that had no prior existence. In addition to its mission of championing living composers, Another Timbre has issued several insightful and inspiring recordings of the music of John Cage. The catalog includes two separate recordings of “Four6” for mixed ensemble, along with recordings of “Four4” for four percussionists and “Three2” for three percussionists, and a septet realization of “Cartridge Music.” Two particular favorites focus in on Cage’s music for piano with John Tilbury’s realization of “Electronic Music for Piano, 1964,” and more recently, a resplendent four-piano realization of “Winter Music.” Key to the success of these projects has been the considered choice of participants since it is incumbent upon them to immerse themselves into Cage’s compositional framework, absorb the composer’s instructions, come to a common perception and approach along with their collaborators, prepare their parts within those parameters, and perform the piece within the overall agreed-upon context. Choosing one’s colleagues wisely is paramount. 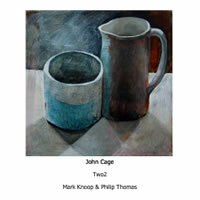 This recording of “Two2” reunites Philip Thomas and Mark Knoop, both of whom participated in “Winter Music,” and both with rich experience in Cage’s music. And they are the perfect pairing. That common agreement on time is central to “Two2.” The basic structure is built around 36 sections based on a “renga,” a Japanese form of collaborative poetry, with five events per section. Cage structured notes and chords across the two piano parts and the rule is that each pianist is free to pace their part however they like. But neither can move to the next event until both have finished their sounds for that bar. In Cage’s other Number pieces, each musician operates independently, with an eye toward a stopwatch and the time brackets of their part. But here, Cage instructs the performers to rely on their “inner clock.” This process and freedom toward marking the passage of time as a collective endeavor is what sets “Two2” apart. In an interview on Another Timbre’s site, Thomas explains how this invested freedom led him to reevaluate “Two2.” Thomas’ exposure to the piece was through a recording by the piano duo Double Edge (for whom the piece was written) which clocks in at 35 minutes, and a few performances that stretched the piece to around an hour. His impression was that “there were just too many notes, too much material in the piece such that I quickly lost interest.” But upon looking at the piece and the instructions, he realized that there was something there he wanted to explore further. He notes that as opposed to Cage’s other number pieces, you don’t have a stopwatch and you need to be fully aware of the other player’s music as that collective agreement that a bar is over is what determines when it is ready to move to the next section. Listening becomes paramount as each player needs to account for where each other is for the piece to work. With this in mind, he started thinking about what that might mean in performing the piece with a more expansive pace. Taking this notion of the pacing to Mark Knoop, the two began work on a performance which resulted in extending the overall duration to just over two hours. Listening to the piece unfold over the course of 128 minutes, it is easy to suspend any notion of the passage of time. Cage intentionally eschews any sense of linear development, setting up an unhampered framework where notes are sounded and left to hang without any specified notion of defined linearity or harmonic connections. Start and end become immaterial, as if one happens in to the piece in progress and leaves midstream of an infinite flow. Memory flickers as successions of chords rematerialize but not in any readily identifiable way. Notable in the recording is the decision to meld the two piano’s together rather than panning them spatially, allowing the two to unify into a collective voice. The first time I heard Robert Johnson’s King of the Delta Blues I was immediately swept into a completely new and unique sonic world. It was more than what he was playing and singing, more than the timbre of his voice and guitar, more than the recording quality, more than the singularity of his genius; it was a combination of all those things. 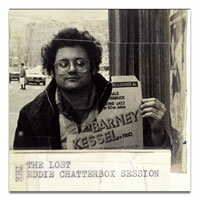 Listening to Eugene Chadbourne’s The Lost Eddie Chatterbox Session elicits a similar feeling: it conveys me into an intimate aural and creative space that exists apart and beyond my everyday soundscape. Recorded in San Francisco on Christmas Day, 1977, and released on cassette in 1988, The Lost Eddie Chatterbox Session features the enigmatic and inimitable Chadbourne serving up unique solo acoustic guitar takes on a dozen Monk tunes, a handful of Bird’s, a few standards, and several originals. His performances run the gamut from fairly conventional interpretations to full-on deconstructions. He sticks close to the melody on “As Time Goes By,” yet on the next cut, “Smoke Gets in Your Eyes,” he thrashes the familiar tune to bits before reassembling it into something more lyrical. Some performances are exercises in brevity, as on the 73 second slash and dash through “Criss-Cross,” while others like “You Go to My Head” exhibit a more measured and worked-out approach. Throughout the album’s 30 cuts he mixes fleet, yet slightly-askew bebop phrasing (“Dewey Square”) with Delta bottleneck swoops, quiver, and cries (“I Let a Song Go Out of My Heart”); plaintive lyricism (“Central Park West”) with furious assaults on the tune’s very identity (“Brilliant Corners”); or sometimes, all of those within a minute or two. From start to finish, the album exudes charm, from its DIY-recorded-in-a-bedroom audio quality and Chadbourne’s announcements of several of the song titles to his unabashed and youthfully earnest approach. With the addition of four previously unreleased tracks, the album is nearly 80 minutes, which in one sitting is quite a lot to take in. But no matter, sit back and let Chadbourne take you through the looking glass to a musical place that’s eerily familiar yet wholly unknown. 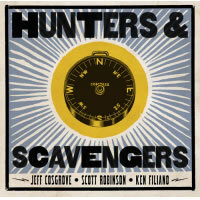 Hunters and Scavengers, from Jeff Cosgrove, Scott Robinson, and Ken Filiano, is what happens when three very talented and highly accomplished musicians come together and record without seemingly having developed a group vocabulary and concept. The date has a kind of nervous, dark, and unsettled feeling where the trio’s members don’t quite seem comfortable together. Robinson, who can just about do anything on a reed instrument, sticks to tenor throughout. Considering the immense vocabulary and stylistic range he can draw on at will, strangely enough, one gets the feeling that his playing at times falls into a kind of “guess and check” mode; at others he seems to offer up place holders and hoping for inspiration. Cosgrove and Filiano are more than worthy interlocutors, and it’s obvious each member of the trio is listening hard. Yet, for some reason, the performances generally lack assertiveness and a confidence in which direction the music should go. It makes for a somewhat frustrating listen that feels longer than the album’s tidy forty-four minute length would suggest. The group does hit its stride on the penultimate cut, “Song of the Cuddlefish.” Whereas previous tracks hesitated in going far out, Cuddlefish dives for the deep sea. Gone are Robinson’s obligatory Trane-ish invocations and brief sheets of sound. These are instead replaced by multiphonic provocations, brief screeching decrees, and even a few chicken clucks. It sounds as if Filiano put his bass through effects, which adds an extra dimension to the sonic space—one almost hears a hint of arco whale song. Cosgrove slowly builds his activity level to add complexity and momentum, shaping the piece more so than earlier tracks. The cut revels in its weirdness. The trio’s every gesture sounds more assured, more confidently executed, and more like the product of a group that has something to say and knows how to say it. The album concludes with a stirring cover of Ornette’s “Lonely Woman.” Perhaps this performance is more rewarding because the composition provided the group with a common foundation from which to proceed. Hunters and Scavengers would have benefitted from a whole lot more of that. Two superb albums, recorded nearly 40 years apart, open windows into two periods in composer-woodwind player Vinny Golia’s evolving creativity, revealing both continuity and contrast. The French Dark Tree label gives the previously unavailable wind quartet concert the deluxe historic release treatment with a booklet containing a detailed Mark Weber essay and period photographs and ephemera. 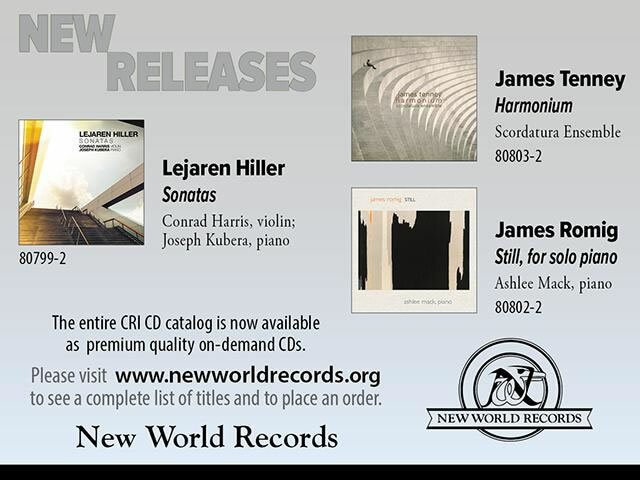 The well recorded and mastered session features Golia, clarinetist John Carter, cornetist Bobby Bradford, and trombonist Glenn Ferris – all in tip-top form. Carter is especially irrepressible, pouring out torrents of notes with a fleetness and ease that’s breathtaking. But the whole band is deeply engaged with the music. Bradford is lyrical and sly; Ferris plays from a whisper to a shout, riffing or uncorking long intricate lines as the occasion calls for; Golia’s multi-instrumental prowess adds varied tone color and emotional heat. 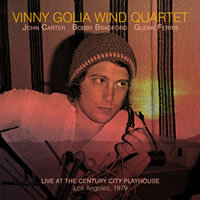 The quartet is the sort of Band Not Normally Heard in Jazz that grew to artistic importance in the 1970s. There’s no drummer, so the ensemble highlights the rhythmic function of horn players; each member is a drum in his own right. The intensity of sound production and the tension and release generated by layered voices improvising or interpreting a score create swing. It’s these characteristics – and improvisation – that place the music squarely in the African American tradition, despite the classical instrumentation. In the compositions “#2” and “Views,” Golia is concerned with blurring the borders between written and improvised, implying the equal legitimacy of both. The writing generally uses either short phrases strung out in a series of variations or longer more involved lines with a continuous flow. Both approaches (often within the same composition) provide inspiration for spontaneous development. Few were better at making seamless transitions between music on paper and music invented on the spot than these players. When they improvise on “#2,” for instance, they create structural elements, patterns, and repetitions that help order the spontaneous creativity. Their interpretations of the score are relaxed and spontaneous sounding, with improvised embellishments that help to further disguise the differences between composed and individually created. Every moment, written or improvised, sounds vivid, supple, and confident. The line between improvised and composed parts in “Chronos I” and “Chronos II” are more defined, as the writing provides clear signposts or anchors between unaccompanied soloing. The soloing is uniformly excellent and the ensemble jumps on the compositions with an urgency and relish that’s a joy to hear. There is nothing else like this in the early Golia discography and that makes the disc, along with the quality of the playing, a valuable addition to his catalog. Forward to the present day to the sharply contrasting Trajectory, featuring a more conventional sextet, with three horns and three rhythm. If the wind quartet tapped into the ‘70s chamber-jazz zeitgeist, the sextet is in sync with more recent jazz hybrids incorporating rock and odd meters. Despite the surface stylistic differences, however, Golia’s personal voice remains strong and clear. Over the years Golia has developed as a composer. His melodies have grown long and intricate and their momentum carries them through fluid passages as well as rocky, disjointed ones. “Gift of the Nile” consists of a long, maze-like, post-bop melody picking its way over a slamming rock beat. “Sparks or Dare” is a carefully coordinated tangle of several lines. “Well, it’s a valuable appendage ...” derives its title from a ridiculous story Kramer tells in a Seinfeld episode about reuniting a woman with her severed toe, and is just as outlandishly complicated as the anecdote. Most of the titles on this double album reference pop culture, comic books, or science fiction and horror movies. “Doctor Loomis, Welcome Back to the Hospital” name checks Donald Pleasance’s character in the Halloween movies; “Ugly Bags of Mostly Water” is how an alien race describes humans in an episode of Star Trek: The Next Generation. Golia’s sense of humor and absurdity play a larger role here than the more sober titles on Live at Century City Playhouse. 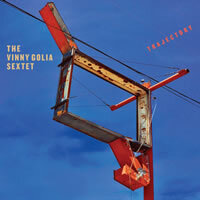 Golia’s sextet arrangements, like the wind quartet arrangements, highlight instrumental colors, different pairings of horns, and harmonies that shade and weight the lines in rapid, ever-changing succession. “Ts’emekwe” (another name for Sasquatch) passes notes and short phrases among two saxophones and trumpet for a kaleidoscopic effect. The aggressive “OK Doctor Xavier, I guess only women have ... them” (Doctor Xavier: founder/leader of Marvel’s X Men) lobs explosive horn riffs, simultaneous soloing, and hot, noisy guitar at you as it charges ahead. All the compositions have a breathless, what’s around the corner excitement to them, a sense of brio and adventure that’s contagious. Strong as they are, it’s Golia who frequently makes the deepest impression. His fast and furious baritone wrangles urgent lines into ever more baroque contours as he charges through “By the end of the day ...”. In contrast, his solo on “The Penebus” seems deeply integrated with the band, making use of space that lets Miller Wrenn’s thick arco bass and drummer Andrew Lessman’s steady pulse shine through, then he spins lines that deliberately thread their way through Noice’s dense weave of guitar effects. Where once Golia was the young firebrand in a band with his elders (he and Ferris were the youngsters in the wind quartet), now he’s the elder statesman leading a band of his former students. And it’s to his credit that he is still in an exploratory mode, even after more than 40 years.